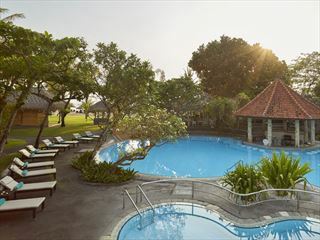 Tucked away in the Tanjung Benoa - Nusa Dua resort area along Bali's southern coast, this wonderful resort offers all-inclusive luxury alongside some of Bali's most stunning seaside landscape. 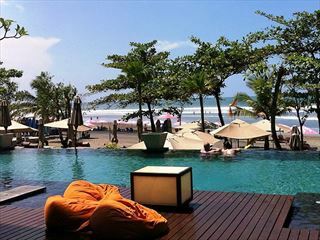 With captivating views of the Indian Ocean, attentive and friendly staff, and a myriad of activities for couples and families alike, this retreat is a beloved part of Bali. 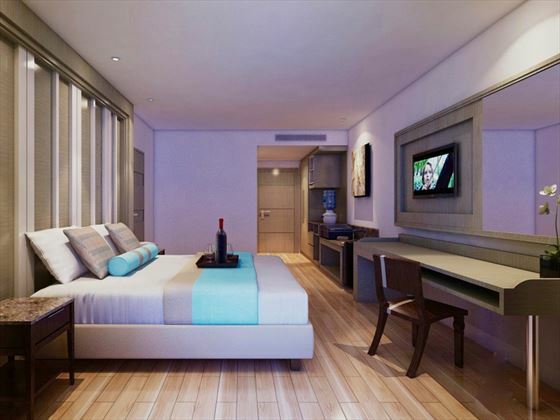 The rooms and suites here adopt a modern take on traditional Balinese decor, with dark woods and classy interiors adding to the sense of luxury. 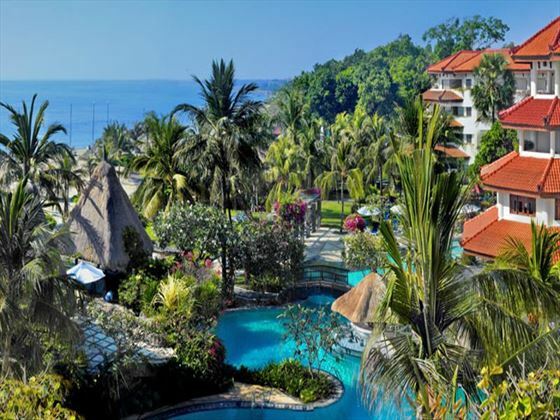 All offering at least a small furnished balcony overlooking the ocean or tropical surroundings, they present a scenic spot to relax and unwind. 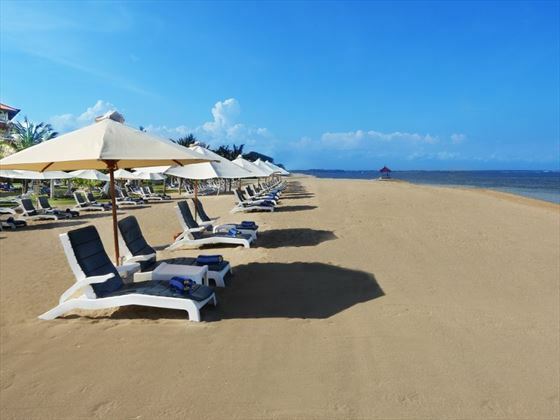 There's plenty of fun to be had at this lively beach resort. 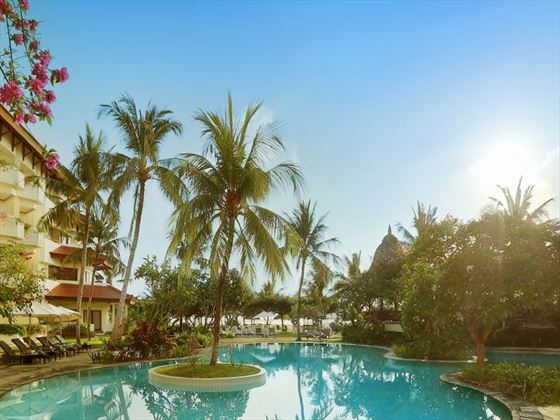 From the spacious main pool and beach volleyball courts, to the games lounge and bike rentals, there'll be lots to keep you on your toes should you fancy a break from resting on the beach. Once you've worked up an appetite, the resort will take you on a culinary journey around the world with its variety of fabulous restaurants. Try authentic Indian cuisine at Bumbu Delhi, treat yourself to grilled seafood at Jukung Grill, or end the day with a refreshing cocktail at Panorama Bar. 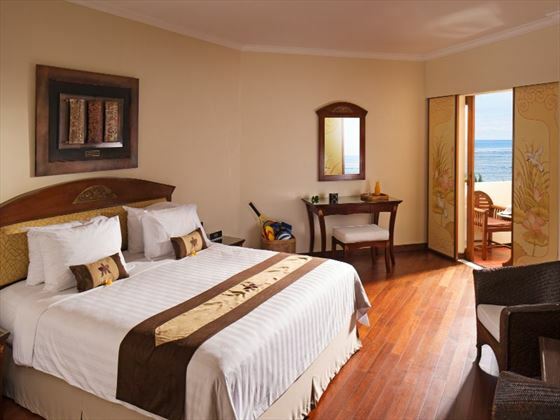 Ocean View Suite - features perfect ocean views, a large marble bathroom with sunken bath, living room, video and board games, and bedroom. These suites sleep a maximum of two adults and two children or three adults. 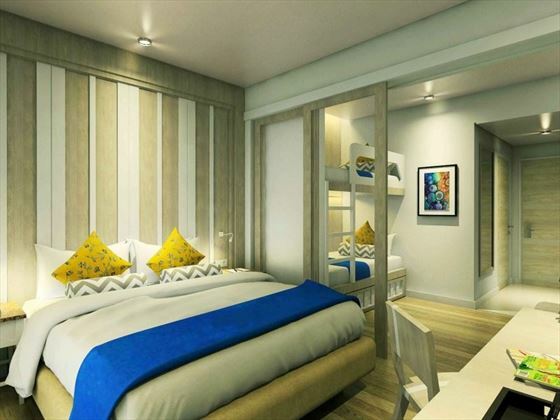 Family Studio - 45sqm located in the new family wing, these lovely rooms are only steps away from the beach and children's water splash playground. Sleeps a maximum of two adults and three children in a king bed, bunk beds and a trundle bed available separated by a full partition for the master bed and kids area or two queen beds available. 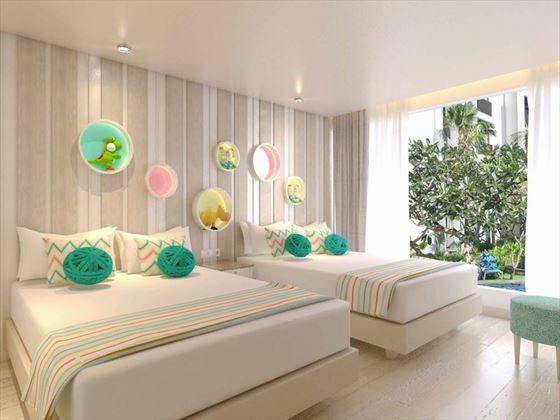 Kids Suites - Large 60sqm signature suites located in the family paradise, close to the beach offering bunk beds, partial ocean or garden views and a range of kid's activities. Sleeps a maximum of two adults and three children. 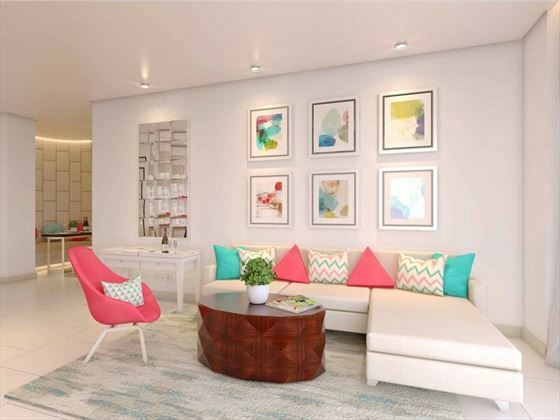 Two Bedroom Suite - Ideal for large families of up to six members, with 85sqm of space, two bathrooms, ocean or garden views and a lounge it is great for relaxation and comfort. Sleeps a maximum of six adults or/and five children. 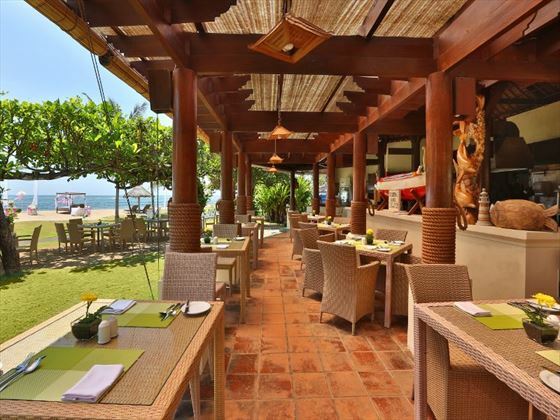 Grand Café – A relaxed venue with views of the pool, serving international and Asian dishes; open 24hrs daily. 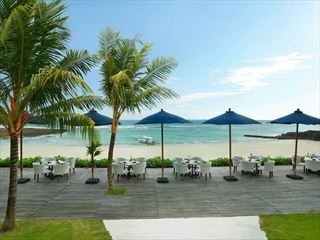 Jukung Grill – A menu of fresh seafood and BBQ meats, served up in front of the Indian Ocean; open daily from 10am-5pm. La Cascata – Italian and Mediterranean classics are served in this friendly restaurant; open daily except Tuesday, from 6pm-11pm. Panorama Lounge – A stylish bar with cocktails, spirits and wine selections available, as well as live music each evening; open from 5pm-1am. The resort is great for families, with family-friendly rooms available and plenty of activities to keep kids and adults alike entertained. 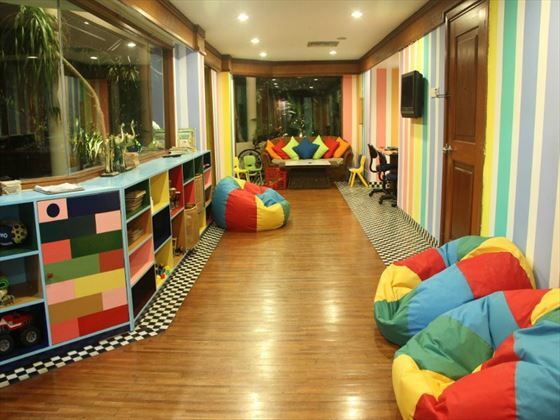 Bamboo Kids Club – For ages 3-12yrs; a fun environment for kids to enjoy, this club offers daily activities with in and outdoor play areas, computer games, movies, board games and fun activities. Open daily from 10am-5pm, with break time from 12pm-1pm. 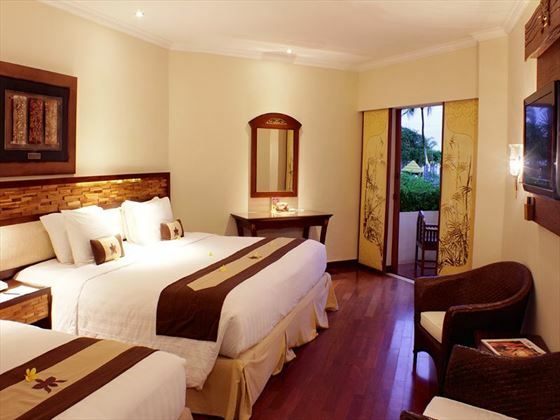 Long Stay Offer Stay for 10 nights or more and receive a complimentary upgrade from Deluxe Garden to Deluxe Ocean. 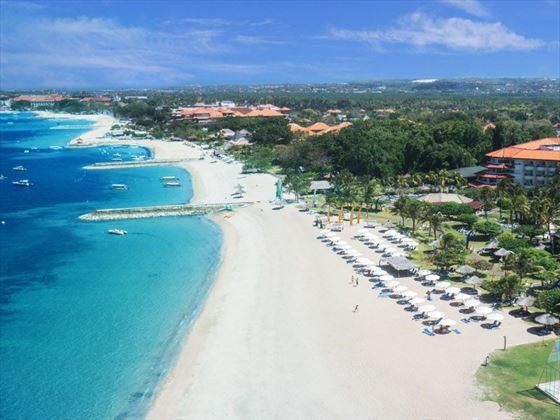 Valid year round excluding 24 Dec - 4 Jan.
A beautiful Balinese beachside getaway, located in Tenjung Benoa in Nusa Dua and ideal for those hoping for a contemporary, luxurious stay iright by the beach.